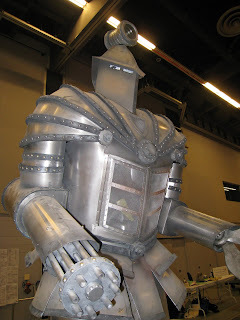 Books & other thoughts: WorldCon 2009 - What a blast! Well, I'm back from my amazing weekend in Montreal, and it was so, so much fun. It was my first WorldCon in four years, and it was so good to be back. I brought a friend with me, Devinoni of Bracing for the Zombie Apocalypse (which, sadly, he has been neglecting these many months), and we had a fabulous time. This is the view from the hotel room. 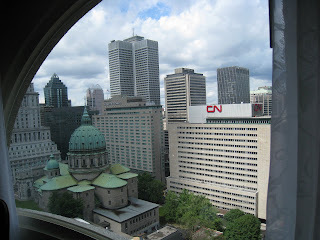 I loved Montreal! Everyone was so nice, even though my French is pathetic and seems to sputter into nothingness somewhere along the line between my brain and my mouth. The city has so much character, both in the old section as well as the more modern parts. There are interesting artistic touches all over the place, statues, artwork on the sides of buildings, evocative fountains; there was even a peaceful little park that was made around the ruins of an old church. 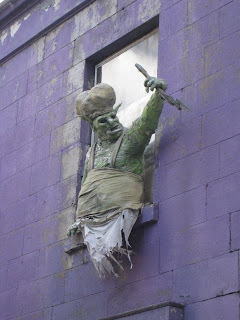 Here's an interesting artistic embellishment that was on the side of a strange building that, from what I could tell, was a restaurant with a haunted house theme. I walked past it every day on my way to the convention center, and it tickled me every time. The restaurant looked as though it was closed down, but maybe they were going for that look of abandonment, thinking it would add to the atmosphere? Who knows! The Webcomics You Should Be Reading (with Howard Tayler, Joe Pearce, Tom Galloway and Claude Lalumiere); Let the Guy Scream: Women in Current Media SF/F (with Heather Urbanski, Odellia Firebird, and Trisha Wooldridge); an editors panel in which editing anthologies and magazines and selecting stories was discussed (with Ellen Datlow, Lou Anders, Stanley Schmidt, Sheila Williams and Rani Graff); Once Upon a Time There Was a Gender Variant Metaphor, which discussed homosexuality in F and SF, coded and otherwise (with Lila Garrot-Wejksnora, Wendy Gay Pearson, and Violette Malan); Fairytales in the Comics (with Bill Willingham, Kevin Maroney and Paul Cornell); and Writing for Teens (with Fiona Patton, Ben Jeapes and Anne Harris - Eoin Colfer was supposed to be there, but I never did see him - he was supposed to give a reading, but he wasn't there either, and there was some speculation about whether he ever did get to the con at all). The discussions were so fascinating and inspiring that I felt my brain slowly start to swell up with information and ideas - and what better way to let things settle than take a break and have something to eat. And when it comes to good food, Montreal has a lot to offer. There is a lot more to talk about, but it will have to wait for the next post. If anyone would like to know more about those panel discussions, let me know. I took a few notes, and at least for the webcomics one I plan to hunt down links for the ones that were discussed and recommended, and I'd be happy to share them if anyone is interested. That sounds like so much fun! It truly amazes me what imaginations some people have. Glad you enjoyed it. Aww I'm glad you had a wonderful time!!! :) The view from the hotel building was a-m-a-z-i-n-g!! I would love to know what "The Webcomics You Should Be Reading" were =) And of course, anything else, because I doubt I'll be going to a WorldCon any time soon! Thanks! Um.. you were staying at Chateau Champlain??? Wowza. I didn't realize that (I can tell from the curves windows ;). Lucky you! And I have never seen that little haunted chef guy before! If you remember what street you saw him on please let me know because I totally have to go look for that place and see if it's open! wow sounds like you had a fantastic time! Love the shots of the "haunted" restaurant! Mariel - Thanks! Yes, it was constantly amazing to me to to see all the wonderful artwork and hear all kinds of fascinating discussions. Nymeth - Now I wish I'd taken more notes, but I will post more about the panels and what I remember. It was so stimulating! Margo - Thanks. We loved that view, too. Montreal is a beautiful city! Sean - Okay! I will find links and post the ones that I managed to write down. I think I got to that one a little late, so I missed some of the first things they talked about, unfortunately. Cat - spot on! It was the Chateau Champlain. We got a great friends & family deal from Devinoni's partner (hooray for Bagelman!). I am not sure of the address of that restaurant, but I think that we went out our hotel to the right and walked down to Bleury, and it was right on that corner of whatever the hotel was on (I forget) and Bleury. Let me know if you find it! It was always closed during the day, but we usually went back to the hotel a different way in the evenings, so I don't know if it was open at night. I haven't read or seen Earthsong, but I will add it to my list of comics to check out. Thanks! Jenny - I'm just glad you are interested! I'll post whatever I can remember from them. Hope you'll find it as interesting as I did! Sounds like you had a marvelous time. And to be in Montreal must have been the icing on the cake. Booklogged - yes, it being in Montreal was definitely icing on the cake. I wish I'd had more time to explore the city, but maybe I'll be able to go back again some time as a plain old tourist. Hi, Tom - Thanks for stopping by! I hope you'll mention any I may miss that you can remember. I really enjoyed that panel, and I'm looking forward to lots of webcomics reading in my near future. Looks like a fun time. A restaurant with a haunted house theme would be awesome! Anna - Yes, I'm hoping Cath will let me know if it's actually open or not. I went to one in Italy once, and it was creepy and fun, with coffins lining the walls, cobwebs, dim lighting and all kinds of spooky decorations. And the food was great!